Epicenter Press (WA), 9781935347071, 141pp. Some of the most dangerous work in the world takes place in the grounds of Alaska, where crews must deal with gale-force winds, towering seas, long hours, and..."Baked Salmon Wellington?" Kiyo and Tomi Marsh conceived this book of delicious seafood recipes and salty fishing stories while rolling around the stormy Bering Sea on Tomi's 78-foot fishing boat, the "Savage. "What began as a joke about "cooking in the ditch" (the trough of the wave) morphed into "The Fishes & Dishes Cookbook." Besides the 80 surprisingly simple yet mouth-watering seafood recipes - your taste buds will never be the same - this fascinating book also offers tips for cleaning, preserving, and preparing fish; hints for pairing win e with seafood; a glossary of commercial fishing terms; an explanation of fishing methods; on-board fashion tips; and information about sustainability. The subtitle sums up this cookbook--Seafood Recipes and Salty Stories from Alaska's Commercial Fisherwomen--but it's hard to say which is more enticing, the recipes or the tales. The authors have worked for more than 35 years between them as cooks and deckhands in one of America's deadliest industries. (Currently Tomi Marsh is owner and skipper of the F/V Savage.) And boy, do they have stories--being chased by storms, setting up a pizza-delivery boat service in the Pribilofs, Bering Sea rescues, boats stolen by the Russian mafia, cooking while riding the troughs and crests of heavy seas. Then there are the recipes: Alaskan Salmon Niçoise Salad, Cioppino, Sake Steamed Clams, Seafood Enchiladas, Salmokopita, Thai Clam Chowder, Salmon Noodle Casserole. It all combines with photographs, art, a few haiku and sidebars about such things as sailors' superstitions into a wonderful book about Alaska fishing, strong women and delicious food. “They’ve braved the ocean from Ketchikan to the Bering Sea, these “goddesses in Grundéns,” harvesting salmon and crab and halibut and herring. Such hard work produces a healthy appetite, and fisherwomen know seafood at its best. And thus have these fisherwomen — Kiyo Marsh, Tomi Marsh and Laura Cooper — combined their knowledge of seafaring, fishing and the culinary arts into a remarkable new volume entitled “The Fishes & Dishes Cookbook.” Two neat things stand out in this book. A variety of vignettes, glossaries and photos provide an illuminating glimpse of the authors’ fishing lifestyles and the seafood they harvest. Secondly, the 80 recipes are as adventurous as the authors themselves. Betty Crocker, the poor dear, got left on the dock for this one. 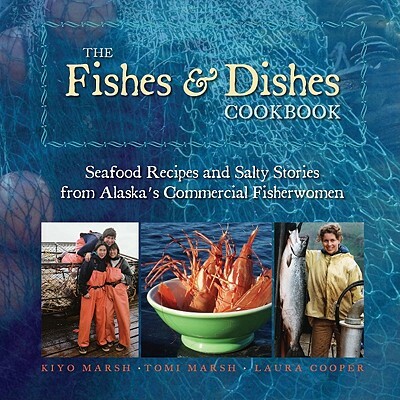 Many Ketchikan residents and commercial fishermen in Alaska are likely to know of at least one of the “Fishes & Dishes” authors and contributors.... Fishes & Dishes has several contributions from other fisherwomen, such as Carol Brown, Stefani Smith, Mary Lang, Shannon Zellerhoff, Roxanne Kennedy and Kacy Hubbard-Patton. One short story is about Dawn and Dave Rauwolf of Ketchikan. There’s also a page on fishing fashion —the book’s working title was “Goddesses in Grundéns” — that covers the fab basics such as Xtratuf boots, Polartec fleece, hoodies, rubber gloves and Carhartt coveralls. It all rings true, written by women who’ve lived at sea and know their subjects well. "This cookbook is an extraordinary brew of super-tasty recipes, fashion tips, cool art, photos, great fishing stories, and a cocktail or two mixed in. Surely Fishes & Dishes will become a culinary classic."